It was filmed in the Regional District of Okanagan-Similkameen, a precursor to the many Hollywood productions that would film in Canada soon after (see Hollywood North and Cinema of Canada). The score was composed by Alan Silvestri. The movie is one of Bart the Bear's earliest roles. The muskox hunt was filmed just outside Hughenden, Alberta. Because the film cost US $15 million to produce and brought in only US$1.9 million domestically, it is considered a box office flop. The film was nominated for an Oscar in 1987 for Best Makeup (Michael Westmore and Michèle Burke). The film currently holds a 10% rating on Rotten Tomatoes based on 10 reviews. However, The Encyclopedia of Fantasy claims: "It is hard to see why TCOTCB has drawn such critical contempt, unless for its tacit Feminism: although the narration is overexpository and the equation of mental versatility with leggy blonde Cro-Magnons, as opposed to shabby Neanderthals, is a cliché, the movie is beautifully shot, well scripted and finely acted." ^ The 12th Annual Grosses Gloss Thompson, Anne. Film Comment; New York Vol. 23, Iss. 2, (Mar 1987): 62-64,66-69. ^ Janet Maslin (1986-01-17). 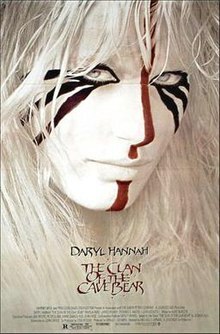 "'Clan Of The Cave Bear'". The New York Times. ^ Janet Maslin (1989-02-05). "Is January The Cruelest Month?". The New York Times. This page was last edited on 9 April 2019, at 10:11 (UTC).